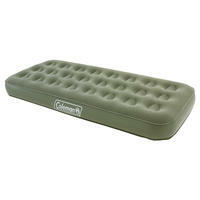 Inflatable one or two person air mattress; suitable for tents, caravans or use as a spare guest bed at home. Air-coils provides more strength and firmness; soft flocked sleeping surface for maximum comfort. These airbeds are soft to the touch but tough and resilient, and can be used indoors or outdoors for a comfortable nights sleep.The double airbed features the Dual Chamber offering two separate air chambers so that each user can define their own level of comfort. Both beds feature Advanced Double Lock™ Valve System, with two valve sealing points guarantee a leak-free product and making inflation and deflation fast and simple. 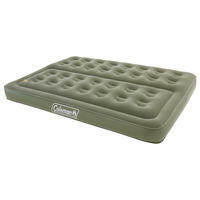 They are constructed from a strong PVC providing a more puncture resistant airbed. This clever double airbed features the Dual Chamber offering two separate air chambers so that each user can define their own level of comfort. This bed has a reduced amount of phthalates, making it kinder to the environment and kinder to you. This single airbed combines comfort with safe durability for peace of mind. This bed has a reduced amount of phthalates, making it kinder to the environment and kinder to you.